Grid research, rooted in distributed and high performance computing, started in mid-to-late 1990s. Soon afterwards, national and international research and development authorities realized the importance of the Grid and gave it a primary position on their research and development agenda. The Grid evolved from tackling data and compute-intensive problems, to addressing global-scale scientific projects, connecting businesses across the supply chain, and becoming a World Wide Grid integrated in our daily routine activities. 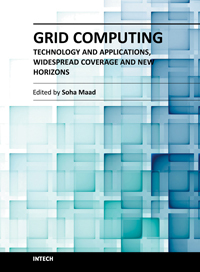 This book tells the story of great potential, continued strength, and widespread international penetration of Grid computing. It overviews latest advances in the field and traces the evolution of selected Grid applications. The book highlights the international widespread coverage and unveils the future potential of the Grid. Dr. Soha Maad obtained her PhD from the University of Warwick in the UK in 2002. She has several years of experience in coordinating, managing, and providing expert advice for research projects in various institutions including Fraunhofer Institute of Media Communication in Germany, INRIA in France, Trinity College in Dublin, Royal College of Surgeons in Ireland, and University College Cork in Ireland.